Enjoy an effective dynamic three-dimensional training for the whole body with an exclusive gym equipment, helped by the professional assistance provided by our physiotherapists. After a few sessions you will become aware of a considerable increase in performance which will enable you to manage everyday life full of energy. Kinesiology is more than just exercise. It helps improve the breathing, shape the body-contours and strengthen the muscles as well as enhance coordination, posture and mobility. 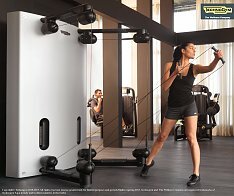 The newly patented “Fullgravity System“ from TechnoGym provides the opportunity to do exercises of a different kind compared to the conventional machines you might be accustomed to. Make an appointment for a taster training. You will be enthusiastic about it!